There's no difficulty trophy this time around! Play on Casual; it makes a few of the puzzles a bit easier and allows you to speed through the HO scenes. You still need to avoid D-Pad Up while in HO scenes/minigames, though! 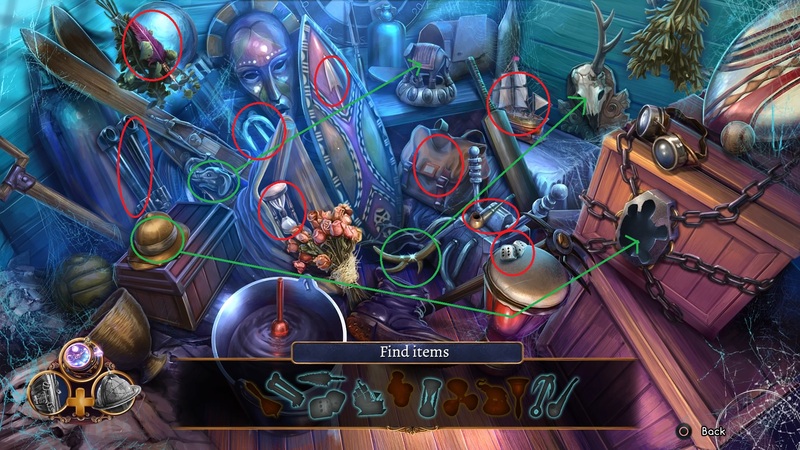 The list is pretty standard for any Artifex Mundi games; the only thing you really need to keep in mind is Triple Luck, which requires you to do 3 HO scenes in a combined 10 minutes. Because we're playing on Casual, this means we can use the crazy clicking method – namely, whenever you're in an HO scene, just spam X while moving the cursor around and see what you can pick up. Do this for all HO scenes unless instructed to otherwise, and you should be fine for that trophy. Once again, sometimes the names of places are different from what is listed on screen. I'm going with what the in-game map calls them. The autosave on this game isn't the best. Quitting to the main menu will always trigger the autosave, though. And you may want to periodically, as this game crashed on me twice while writing this walkthrough. Read the following solution before continuing, so you can unlock Time Stands Still . Number the cable heads from left to right, 1-6. 3 is the top one and 4 is the bottom one. Quit to Main Menu and BACK UP YOUR SAVE. We're going for a few HO-related trophies here – namely, No Mistake and Good Reflexes . If you don't unlock both of these here, reload your back up and try again. The pipe can sometimes be iffy about whether it wants to be picked up without error - if it's giving you a hard time, take your time on a different HO scene instead. This image has been resized. Click this bar to view the full image. The original image is sized 1920x1080. Depending on how you did during the previous HO scenes, you may unlock Triple Luck here as well. You still have plenty of time to unlock it, though. Turn them the way the paper shows, pressing to switch between each. Once you've set the final one, press to switch again to see if it opens automatically or if you need to keep tweaking them. Solve the puzzle – you're putting together a picture of a peacock. Start with the pieces against the edges and work your way inward. Pick up kerosene, sealing putty, and putty knife. Read the note. Set the switches to what the paper tells you to. After setting the three switches, click the arrow dial before moving on to the next number. Start by moving fat green fish to 4. Next fish on 5, next on 6. Pick up yellow fish and move it to 2. Next fish to 3, next on 1. There's three sides of “find a piece in one figure and put it in the empty space in another”. All pieces are found and used on the same side. It's very easy. Once the figures light up you can click the control stick to go to the next side. Zoom on binoculars. Click the focus button once, look at the map, then repeat until you've looked at three locations. Put puzzle together – nothing needs to be rotated and pieces will lock in when placed correctly. If you want a bit of extra backstory, click the papers and such in the opened table and pick up the necklace. This is optional, and a reward for getting all 30 atom symbols. Video guides of this walkthrough are fine as long as I am credited in-video and the guide linked.